Friday night was the Christmas party at Stamp Heaven. 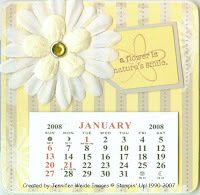 For those of you not familiar, Stamp Heaven is a group of ladies that gather monthly (except December) to stamp. Usually we have demos, card swaps, and lots of fun things going on! Each year we have a Christmas party in November and we have a stamped gift project swap for 40! This was what I chose this year. I have to say it was a fairly quick project, but don't wait until you only have two evenings left to work on them! I had a couple late nights! If you haven't seen these before, they are chipboard coasters like restaurants use. These were plain, but you can sure "borrow" restaurant ones too! I covered the coasters with Designer Paper and sanded the edges with a file. This eliminates the paper edge and blends it into the coaster. A little messy though, and dusty-be careful if you have any asthma or breathing issues! I found myself coughing. The flowers were dyed by dipping them in cups of water with reinker. I didn't have time to paint each individually, so I dipped them like Easter Eggs! Worked pretty well. They are lighter than if I had colored, but it worked fine with these papers. I punched a hole thru the chipboard with my Crop-A-Dile and mounted the flowers with a Rhinestone brad. 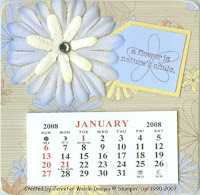 The calenders were added-they have the tear off pages for the entire year. The tag is punched from coordinating CS with the Small and Regular tag punches. The saying & flower are from the hostess set Vases in Vogue . Lastly I added magnets to the back so the calendar can hang on the fridge, in a locker, on a file cabinet... Enjoy! Hope you're all having a good weekend! So far, ours has been busy-filled with football. K-State suffered a miserable loss to Nebraska today. Luckily we were not at the game, just a tailgate/party. YIKES! But, our local high school team won their semi-final game and is headed to the State Championship-Go Cardinals!!! 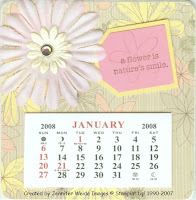 I LOVE my calendar!! It's already on the fridge, I fear January will be here before I know it!! !